Rare is the grape that this wino comes across that fails to inspire in one shape or another. Perhaps due to a Pollyannic outlook on life or a natural proclivity to new experiences, it is likely a personality fault of some sort or other. Nonetheless, today is the day when a grape failed to inspire. That grape is Duras. Duras is a grape from the SW part of France in Gaillac AOC where it is reportedly required to be planted to preserve the indigenous grapes from the invading internationals like Syrah or Cabernet Sauvignon. And that is likely to the credit of those looking to protect their heritage and protect the wines that they (hopefully) love to quaff. For an ignorant outsider however, the wines are alcoholic juice boxes. Suitable for that special someone’s 40th birthday party with sippy straws but not to be paired with much beyond birthday cakes and pencil-esque amounts of frosting. Caveats abound of course – maybe this wine from 2011 was supposed to be drunk much earlier, maybe this is not repreesentative of the grape overall, maybe (definitely) this is the entry rung of this producer, maybe (probably) this wino chose the cheapest bottle of this wine with this grape because it was a new grape, maybe, maybe, maybe. And yet, the fact remains – this wine was only better once slightly oxidized and past any semblance of its prime. And with little knowledge and a minuscule geographic footprint for this grape, this grape is bearing the brunt of that sippy cup angst. Because birthday cake should be eaten on its own. Never paired with wine. * Day of opening (curmudgeonly reviewed before flying away from home) — Juicy and harsh, lots of alcohol throughout. Those who like it will probably call it rustic. * Several days after opening (begrudgingly reviewed again, after a flight to home) — Smoother after a few days – still juicy but less like a high-alcohol young Beaujolais and more like a young California Zin. Meaty pasta is a good pair. 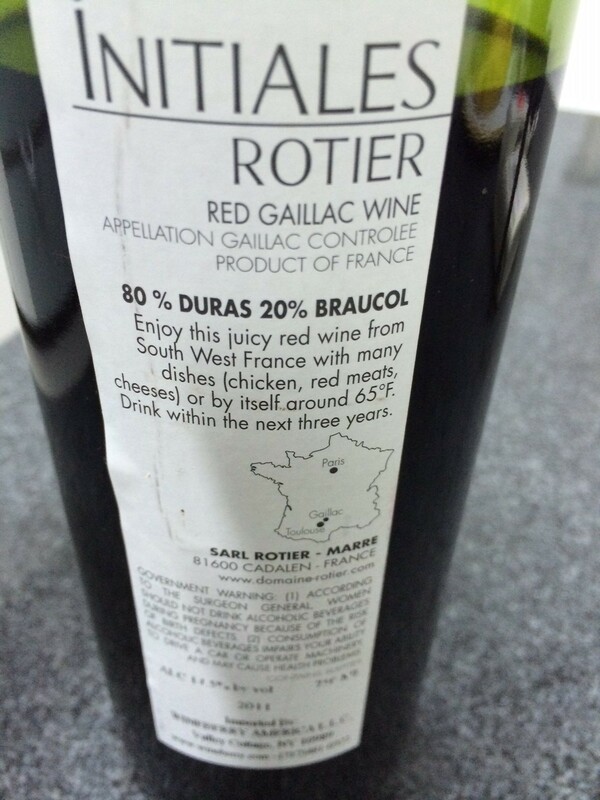 * At first, I thought this wine had two new grapes – Duras, along with Braucol. Turns out, that grape has many names, one of which is Mansois that was reviewed previously. Kinda glad to have this blog in moments like this. * Duras grapes are only found in the Gaillac region. Understandably. * Duras grapes are typically blended with other grapes. A wise move.